We are thrilled to be able to offer your our catering services in the great town of Ashton-Under-Lyne. Situated at the foot of the glorious pennines in Greater Manchester and on the north bank of the river Thame, this town of just over 45,000 people, like many of it’s Northern neighbours was once a North West hub for the cotton industry. Evidence of this remains to be seen today with beautiful grade listed cotton mills lining the streets amongst some of today’s more modern structures. Now, if you’ve ever visited Ashton-Under-Lyne or any of the region’s old mill towns you’ll understand what I mean when I say that there’s something rather lovely about rows of old fashioned terraced houses overlooked by fantastic pennine hills and the canal weaving it’s way through the town. For me, Ashton-Under-Lyne epitomises the scenery of a Northern town and perhaps that is why I enjoy this place so much. We are lucky enough to be able to operate our catering business here within Ashton-Under-Lyne and have had the pleasure of attending some wonderful events including weddings, parties, christenings and a whole range of other miscellaneous occasions. 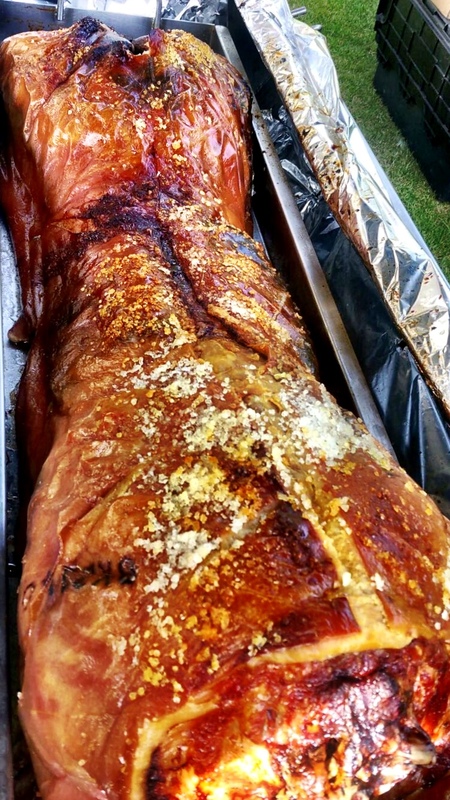 The hog roast industry is currently thriving but here at Hog Roast Ashton under Lyne we have over 20 years of professional experience. This is not a fad to us, this is what we do. I often think that pork is seen as a rather overlooked meat when it’s not sitting proudly on our breakfast plates on a Sunday morning. Pork is more than bacon butties and gammon and pineapple; pork is a delicious meat that when prepared with expertise and carefully cooked slowly for several hours becomes a melt in your mouth, irresistible luxury. Delicious! By hiring us to cater for your event in Ashton-Under-Lyne your hungry guests will enjoy a five star catering experience. We will provide a delicious, 6 hour spit roasted hog (or an alternative meat of your choice), with some truly unforgettable accompaniments. Our experienced team will prepare, cook and serve the food – and there’s no need to worry about tidying up either as we will quickly and discreetly do this for you leaving you to enjoy your special occasion! Hog Roast Ashton-Under-Lyne would be delighted to offer it’s catering services to you here in this brilliant Northern town.